Don’t forget to check out other Let’s Lunchers’ Asian dishes below! And if you’d like to join Let’s Lunch, go to Twitter and post a message with the hashtag #Letslunch — or, post a comment below. Slice the tofu into bite size pieces (¼ inch-thick rectangles) then dry off each piece with a paper towel. If you’d like your tofu a little crisper, lay the tofu slices on paper towels for 15 to 30 minutes before frying. Heat pan with one tablespoon of vegetable or corn oil and one tablespoon of sesame oil. When oil is super hot, fry the tofu slices until each side is browned and crisp. Arrange tofu on a plate, mix the rest of the ingredients in a bowl and drizzle over the fried tofu. Serve immediately with rice. 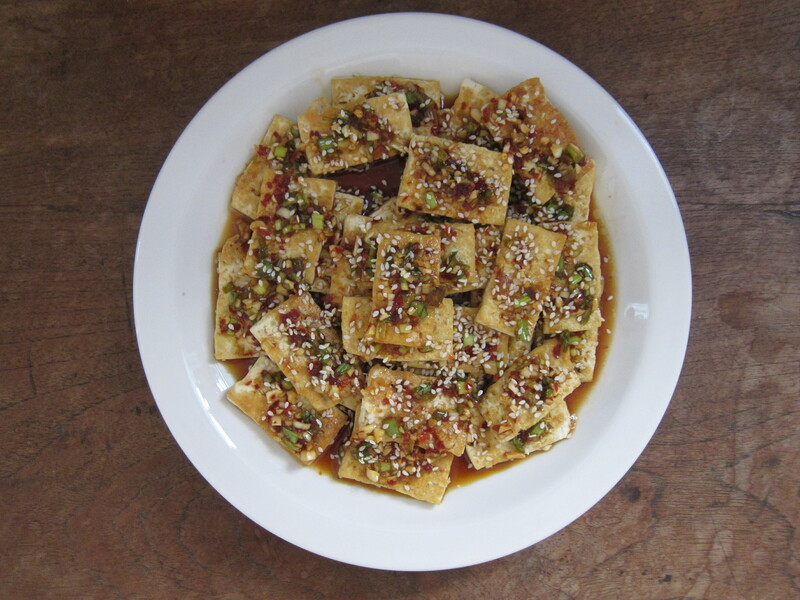 This entry was posted in Asian, Korean, Let's Lunch, Recipes, Vegetarian and tagged Korean, Let's Lunch, Maangchi, Tofu by Cheryl. Bookmark the permalink. Pingback: Bulgogi Lettuce Wraps with Kimchi Chips and Fried Rice | sandwich surprise! I love spicy tofu dishes and this one looks simple and delicious! Happy AAPI Heritage Month! oh, I love tofu and the spicier the better. What kind of tofu do you prefer on the firmness scale? I have become addicted to homemade agadashi and find that the soft tastes better but is much more challenging to work with. I could eat tofu every day. This one sure beats Taiwanese stinky tofu! Yeah — I wish I could like stinky tofu but I never have! I thought this would be complicated, but, no, it’s easy! I can’t wait to try. OMGoodness…Maangchi and Key West mentioned in connection with this recipe just means that the universe has challenged me to try same….thank you for posting…like Nanina…can’t wait to try…and will envision memories of sunset, while living aboard a sailboat, docked in Key West Bight, many, many, moons ago – whilst I devour the lovely tofu!!! Blessings ? Looks beautiful and so easy, must try this. Cheryl, just made this for breakfast. It’s a hit! So glad, Linda! It’s perfect for all meals!